Today, I have the wonderful Michelle Pickett to tell me about her latest release, Concilium. Please join me in welcoming her to my blog. Concilium is an urban fantasy romance. It centers on a young woman named Les who stumbles across and ancient secret, although she doesn't realize it. The people keeping the secret think Les knows about them and aren't too happy, so they set out to kill her. The Concilium is a secret society sworn to protect humans and they send a group to guard Les. Concilium: The Departure, the sequel to Concilium, releases in November. And my debut young adult novel PODs releases in paperback June 4, 2013 (my son's 12th birthday) through Spencer Hill Press. My website has a section on all my writing and my blog has information about upcoming releases and news on giveaways and things like that. My website, blog, facebook, email, goodreads, linkedin, I'm all over the web. But the best way to contact me is through email. I try to answer every email and blog comment I get. If you don't get an answer it's because I didn't get your email, so please send it again. Before Concilium released I'd get two or three emails a week from people telling me they were excited for PODs to come out or Concilium. Since Concilium's release that number has gone up a little, but it hasn't been out very long yet. I'm hoping to hear from more people. I'd love to get feedback and know what they liked and didn't like so I know what to focus on in future books. Yes, they are very humbling. I can't believe I have fans. I don't think of myself as someone that would. Yes. A woman wrote and said—this is a direct quote—"*happy dancin'* I finally have Concilium!!! The wait is over:) Thank you." That made my day. What does your husband/wife think of your writing? Do you ever ask him/her for advice? My husband is very supportive of my writing, all my family is. Yes, I ask him for advice a lot. I was having trouble with a section in one of my books and I was telling him about it. I left to run some errands and when I came home he had two notebook pages (frong and back) full of notes for me to read over. I ended up using part of one his ideas and it fit in perfectly with the rest of the story. Anything chocolate. Magnolia, TX. Fall. Flawed. Strong. I've never used one. I hear they can be quite helpful. When I started writing Concilium I didn't know things like Beta readers and critique groups existed. I just sat down and wrote. I hope I'm still writing and being published. But if my work isn't published I'll be disappointed—who wouldn't be—I'll still be writing because I love it. It's calming to me. I'm finishing up my eighth book now. So far I have contracts for three of them. I do read it and nit-pick at all the things I wish I would have changed. I don't buy it simply because the publisher gives me a copy. Lol! PODs was the easiest to write. I think because it was my third book and I was starting to feel more comfortable in my writing and was finding my voice. It was also the most fun. I mean, zombies…come on. Who doesn't have fun when there are zombies around! The Concilium series books were the hardest. They were my first and I agonized over getting them *Perfect,* which, of course, they never will be. We are imperfect people. So I guess I'd have to say the actual writing part wasn't the hardest, but the editing and rewriting was. Wow, that's a hard one. I think it differs for each writer. For me the story comes first. A little of both, I think. Characters definitely take on their own personality as I write. For example, in Concilium I had originally pictured Leslee as a shy, mousey, introvert. That is SO not how she presented herself. So I changed my character sketch to fit her emerging personality. I'm going to tell you about my most rewarding day. It was when my son came home and said he wanted me to go to his school's career day and talk to his class about what I do. There was nothing better than that. Knowing you've made your family proud. The feel was indescribable. She wrote her debut novel Concilium in 2010. It was released July of 2012 by MuseItUp Publishing. 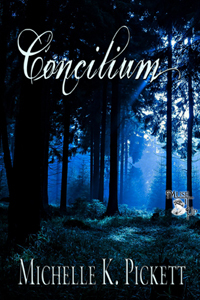 The sequel, Concilium: The Departure will also be published by MuseItUp Publishing with scheduled release date of November 2012. Her Debut young adult novel, PODs, will be published by Spencer Hill Press and is scheduled for release in paperback June 4th, 2013. Michelle was born and raised in Michigan. She now resides in a small community outside Houston, Texas with her incredibly supportive husband, four wonderful children, a 125-pound lap dog, a very grumpy cockatiel and a cat that thinks she's queen. 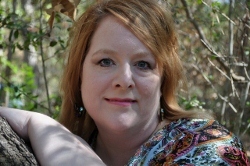 She writes adult and young adult Sci/Fi and urban fantasy romance. I sank deep into the cushions of my couch and waited for them to finish their work. Grabbing the remote, I flipped on the television, surfing the channels. Nothing was on. More than two hundred channels on the stupid thing, and nothing worth watching. Irritated at the television, at Miller, at the whole situation, I hurled the remote against the door. “Crap,” I muttered when it fell to the floor in pieces. “I think you killed it,” I heard Miller say behind me. “Don’t mock me, Miller. I meant that I’d like to throw you across the room,” I snapped. “I just might surprise you. And I’m not a ‘girl.’ Girls go shopping at the mall for flip-flops and lip gloss. And, for the last dang time, my name is Les!” I walked around him, my shoulder brushing slightly against his arm. As I caught the faintest whiff of his cologne, not only did my stomach do a flip-flop, but my whole insides swirled out of place. What is it with this man? I barely knew him. In fact, the only thing I did know was his first name. At least, I thought it was his first name. What was this thing I had going on? A schoolgirl crush? I was twenty-five, a little old for crushes. And besides, Miller wasn’t the type of man I was attracted to. I didn’t go for the mercenary, guns-and-ammo type. I enjoyed the company of well-read college graduates who had stable jobs and good heads on their shoulders. Holy crap, I sound like a snob! A stable man with a stable job. What a joke. I secretly wanted the bad boy. What woman didn’t? Miller didn’t seem to have one stable thing about him. But he smelled so good and looked beyond gorgeous standing in my living room with his hair, mussed from running his fingers through it, falling over his forehead. I trudged into the laundry room and grabbed a broom and dustpan. When I walked back to the living room, Miller was picking up pieces of the demolished remote. “Don’t. It’s my mess, and I’ll clean it up,” I said harshly.